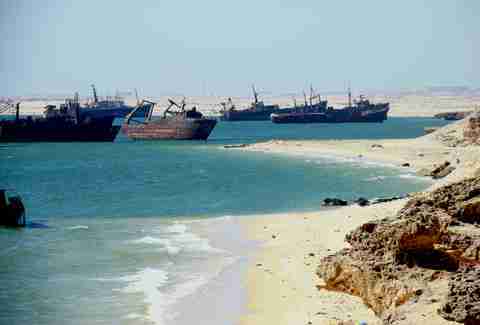 Nouadhibou: apart from being utterly unpronounceable a place most Americans've never heard of, this African sea town's shores serve as the final resting place for more than 300 ships. 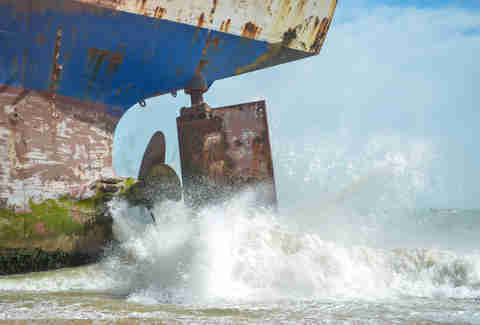 The rusted hulks that litter its coastal waters are considered an eyesore by many (go figure), but they've brought some unexpected benefits to the local community as well -- let's take a look, shall we? The first recorded wreck here was a French Navy cruiser back in the '20s, but this place didn't really get rolling until the 1980s. 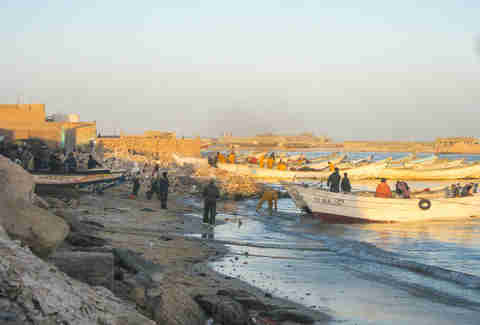 That was when many of the locals decided to get into the industrial fishing game by purchasing old boats that couldn't compete anymore -- totally a sound plan when you're looking to get into the industrial fishing game. 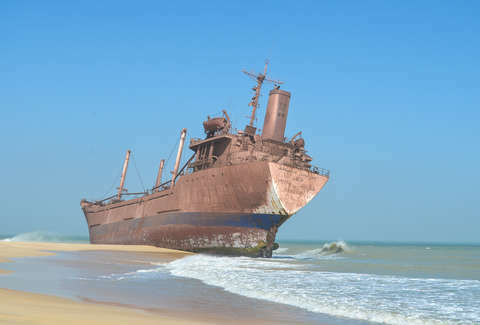 As the years wore on, more and more ships were put out to pasture here after being deemed too old to be profitable -- similar to that broken-down Buick you left on the side of the highway back in college. 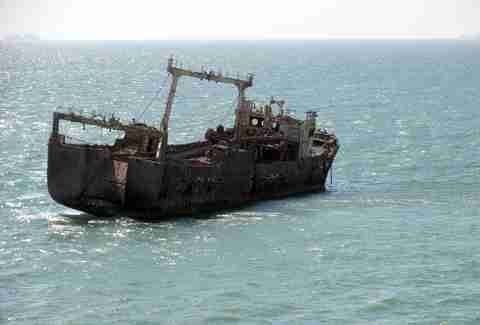 It's not all bad though; many locals've found employment stripping the ships that litter the coastline of all salvageable equipment. Mauritanians are strong believers in that old dictum "when life gives you lemons, let those lemons rot for years and then strip 'em for parts". 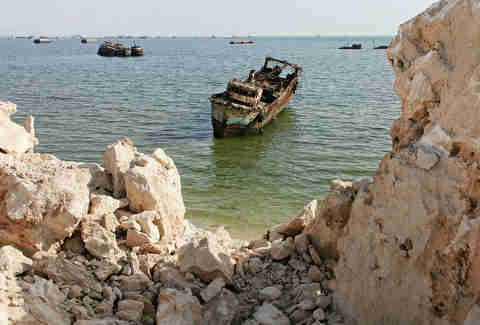 Wrecks like this one are more than just a blemish on the landscape -- they're actual hazards that interfere with the comings and goings of real working ships in the area. Layabouts of the sea, we call 'em. 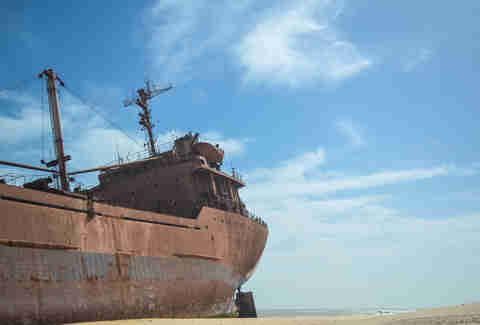 The largest of Nouadhibou's rusted residents is the United Malika, a 387.8ft reefer ship that totally said "screw you guys and your fish delivery, I'm done" before beaching itself whale-style back in 2003. 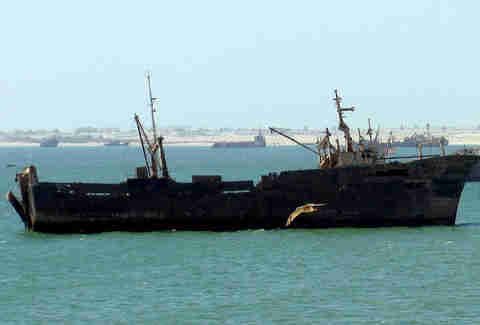 Its 17-man crew was rescued by the Mauritanian navy, along with their fishy shipment, but the giant vessel itself was un-towable. So at this point you're probably saying to yourself "Hey, that ship is huge and all, but he said there were 300 ships here! Where are the rest of 'em?". Calm down and stop saying the word "ship" so much that it loses all meaning direct your attention to the map below, you'll find your answer. See those ship-shaped silhouettes in the top-left corner? 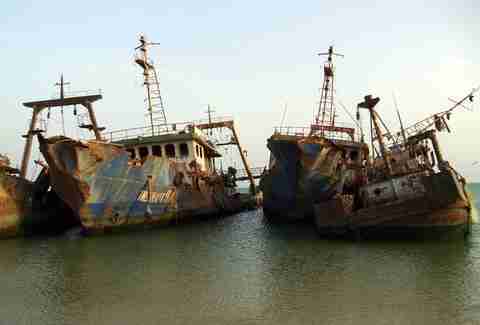 Most of the dead vessels here've sunk to the bottom and can't be seen from the surface. Total bummer, right? Wrong! All those submerged hulks have become artificial reefs, which revitalized the local fish population (previously devastated by the local fishing community's over-enthusiastic fishing practices). The dead ships give the fish somewhere to live, and the fish give people something to eat -- that's some circle of life sh*t right there.